We know next to nothing about Meir ben Elijah: not his date of birth, what he looked like or how he spent his life in medieval England. Shakespeare's life, by comparison, is well documented. However, we do know that he lived in Norwich because the acrostics in his Hebrew poems tell us so. In his long poem about the Exodus we are told: 'I am Meir, son of Rabbi Elijah from the city of Norwich, which is in the Isle called Angleterre'. V.D. Lipman's book The Jews of Medieval Norwich tells us that there was a thriving Jewish quarter in the city at this time and that it was located between the Haymarket, Orford Place and White Lion Street. There was also a synagogue which is believed to have stood close to the site of the present-day Lamb Inn. There is one clue to Meir's identity because the records show that there was a Jew called Milo Kat living in Norwich around 1290 and it has been suggested that 'Milo' is an equivalent for 'Meir'. In the sixteen short poems another acrostic tells us that he is: 'Meir son of Elijah the Hozeh' and Lipman has suggested that his father may have been an astronomer for the word 'Hozeh' can be translated as 'seer'. There is evidence to support this, Lipman claims, in the fact that the Jewish community had a scientific leaning - evidenced by the presence of two physicians, the father and son Isaac and Solomon, and that Solomon had the earliest recorded herb garden in England. Meir's work shows characteristics of German, Northern French and Spanish Hebrew 'piyyut' poems - i.e. that they are liturgical in form and frequently feature acrostics. They were originally discovered in the Vatican Library by Abraham Berliner (1833-1915) who was a German-based expert in Jewish history and literature. Translations of the poems are available in the local studies section at The Forum in Norwich. 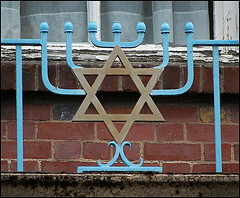 After the expulsion in 1290, there was no Jewish community in Norwich again until the middle of the 18th Century. A new synagogue was built in 1849 on Mountergate, but it was unfortunately destroyed during the air raids of 1942. The synagogue today is located on Earlham Road opposite the Roman Catholic Cathedral. Norwich has another Jewish literary link in the form of Arnold Wesker's play Blood Libel which was first performed at the Playhouse in 1996. It took as its subject the ritual murder of a boy named William of Norwich whose body was discovered on Mousehold Heath in 1144. The Jewish community of the time were accused of slaughtering a Christian boy to use his blood for Passover. The play enacts the accusations and counter accusations and the belated attempt to turn William into a martyr.